Tom McEwens English Leather Corvette Funny Car. 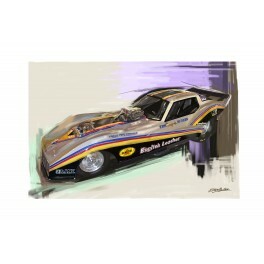 This car was featured in the movie 'The Snake and Mongoose' This 13x19 Limited Edition print is limited to 200 copies. Each print signed by artist. Print is designed to fit an 18x24 frame.